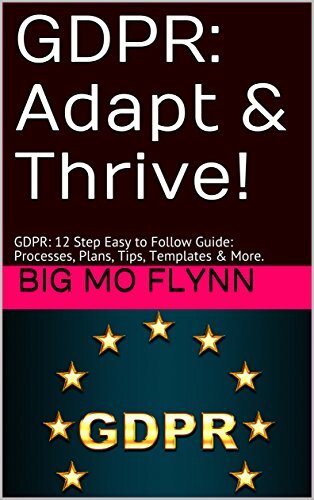 I wrote this book to help companies and individuals with limited resources prepare for GDPR General Data Protection Regulation and also improve business performance in general. It distils both my recent GDPR General Data Protection Regulation experience and my overall 30 years of business experience into short and simple, easy to follow advice, tips and action plans. It should be helpful for all levels of experience, especially for beginners to intermediate, who want to get up to speed quickly and efficiently. This information is curated from the still evolving advice of the top experts – e.g. the ICO (Information Commissioner’s Office) with their “12 step framework” – allied with hands on GDPR General Data Protection Regulation preparation project experience with 50+ companies. So what have you heard about GDPR the General Data Protection Regulation? There is a lot of confusion, partly because some of the rules will ultimately be clarified in the law courts. But we can’t wait around for that. We aim here to focus on the essential business needs, as closely as possible. As you will see, we often break the information into 4 sections, starting with general introductory information, followed by GDPR General Data Protection Regulation specifics and finally “what the experts say” summaries. You will find key policies, processes and document templates, which help companies with limited resources prepare for GDPR General Data Protection Regulation more quickly and efficiently. All the content is based on a common sense approach that is curated from the insights and experience of multiple expert, trusted sources, allied with real life, GDPR General Data Protection Regulation preparation and related project management experience. 3. We Evidence GDPR General Data Protection Regulation Compliance: i.e. this activity produces documentary evidence that we retain to demonstrate our accountability and compliance. Companies have been worried by the threat of GDPR General Data Protection Regulation fines of up to €20 million or 4% of total worldwide annual turnover of the preceding financial year, but the supervisory authorities have been clear that these ‘GDPR General Data Protection Regulation 12 step’ compliance efforts will mitigate any penalties (Ref: GDPR General Data Protection Regulation Article 83). Our members enjoy your logical GDPR General Data Protection Regulation approach.” Hotel Booking Agents Assoc.